At the start of December 2011, my husband was made redundant. It would have been very difficult for us to remain in Berlin as I could not support both of us on my wage and it would have been almost impossible for him to find a new job there. 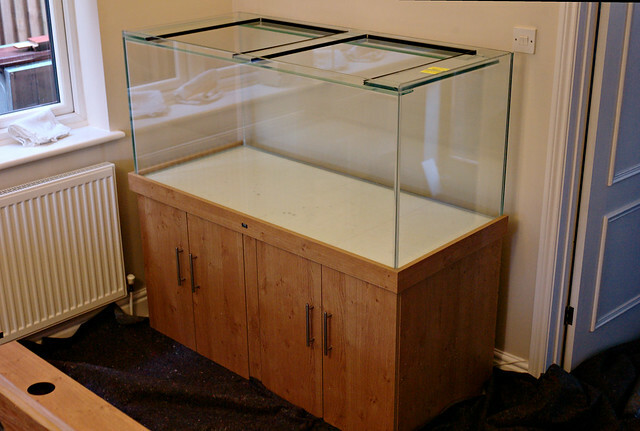 I started selling off most of my livestock and plants immediately, taking some of the fish to my LFS (Aquarien Meyer) in exchange for fish bags and dechlorinator which I used for the return journey, but unfortunately it was quite difficult to sell the aquariums as so many people made appointments to view them, then did not turn up. 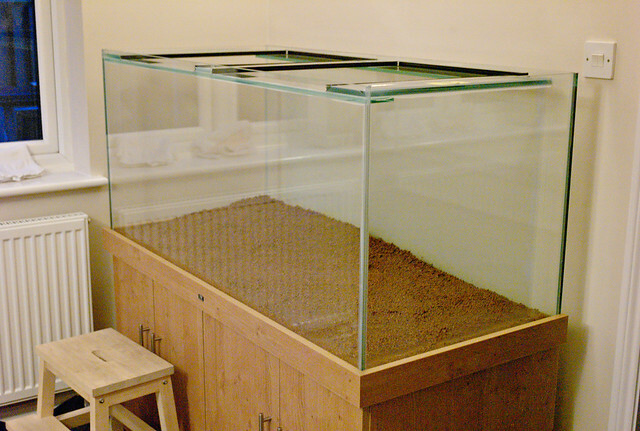 In the end, I managed to sell one of the AquaOne AquaStyle 980 for 50 EUR, the second for 60 EUR and the 420 litre aquarium (including substrate) for 275 EUR, which is approximately what I paid for the tank and substrate when I bought them. Since I have to be careful about the carpet, I have invested in a painters’ fleece which is lined with a plastic sheet on one side. The one which can be seen in the photo is a 10×1 metre piece which was around GBP 5 from Aldi. It did take much longer to wash the laterite than it usually does to wash substrate: I probably gave each 3 litre lot at least 10 rinses before I could see the laterite through the water. It felt like the laterite might have been “99 % dust free”, but the 1 % was just dust and no laterite. Also, I found out that this particular cat litter is fragranced; it took me at least 3 rinses before I could not smell the fragrance coming off the water. In other words, this laterite needs considerable cleaning, more so than most substrates! Tomorrow, I plan to add three bags of sharp sand (sharp sand is sand which has been recently weathered from granite or gneiss) and one of play sand, as I like to see some texture in the substrate, but this sharp sand has too many large grains when used on its own, although I thought it was still worth GBP 0.50 per bag from Homebase. I will also add a plain, black background to the back and the left sides of the tank tomorrow, and a branch of hornbeam which was cut down a month ago so that the van would fit down the driveway during the move.